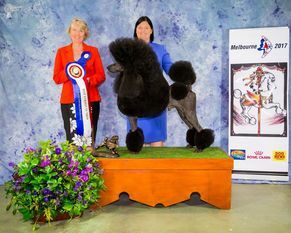 RESULTS CHAMPIONSHIP SHOW - The Poodle Club of Victoria Inc.
8 Mr M Nguyen TOYAMORE MEET STU 2100463018 28/09/2016 Sire: Ch. Montaires Dream Catcher Dam: Ch. Toyamore Zoe Boe Ccd. 104 Mrs K Wyers CH. KELLYVIX BLOOD DIAMOND 2100448524 20/03/2016 Sire: Ch. Kellyvix Davinci Dam: Ch. Kellyvix My Mia Cd. Rn.